We have another update this week. It focuses on balance, UI and difficulty updates based on community feedback. And we've also made a targeted pass at equipment pieces to make them more unique and interesting. We still have a long backlog of community feedback and ideas that we want to get in, and it should keep us busy for a while yet! Ease of Mouse: Redoing the system to select overlapping tiles with the mouse. Should be a LOT more intuitive and easier to use! New Assets: New assets, including new sounds, portraits and spell shapes. Weapons: Staves will now grant +1 range to ranged spells. Weapons: Some rods will now grant a bonus damage to a specific element. Equipment: Updated the stats of a lot of gear pieces. AI: Made the AI smarter and more efficient in many ways. As always the full change logs are on our Steam page, right here. Our main focus currently is wrapping up the first version of all the dialogues in the game, then doing a big quality pass on them, and finally starting their localization. We have a big localization team already booked to handle that part, so we have to get ready for it. Otherwise, we've mostly been busy making various improvements across the board from community feedback, with a focus on adjusting the difficulty. Now that we have the Difficulty Settings, we want to make sure we start tuning things to ensure both new players and veterans alike have a space they can live in happily. There are many changes in this update that should help on that front. 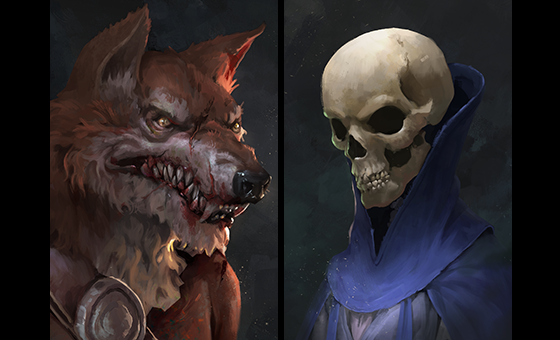 And we're adding new portraits to the game. Perhaps in preparation for Halloween?